Lake Coldwater - Photo by Jim Mason This spring-fed 250 acre lake is a source of pride to area residents. A 3.8-mile road circles the lake and offers good visibility to the entire lake surface. During the winter, the lake attracts Canada geese, mallards, common mergansers, goldeneyes, pintails, gadwalls, and most other common ducks. During migrations white pelicans sometimes use the lake as a stopover. Ospreys are common in fall and bald eagles often winter in the area. Black rails were discovered using the marsh areas of this lake a few years ago and can be heard if not seen calling through the late spring and summer months. At both ends of the lake, beaver activity is visible on the streambank trees. Several beaver dams and ponds are also present. Deer are commonly seen near the locust grove below the dam. Other area mammals include muskrats, raccoons, cottontails, and thirteen-lined ground squirrels. The lake's well-maintained grounds are ideal for robins, western kingbirds, and northern orioles. The grassy areas are inhabited by grasshopper sparrows, western meadowlarks, and prairie lizards. Entry fee, Water available, Restrooms, Boat Ramp, Storm Shelters. 100 campsites with utility hookups. Primitive camping. at the southwest corner of the lake. Click the icon to find a birding list for Comanche County. of the Gypsum Hills Scenic Byway. Directions: From Coldwater (50 miles SE of Dodge City) go 0.5 miles south on U.S. 160/183 and 0.5 miles west. 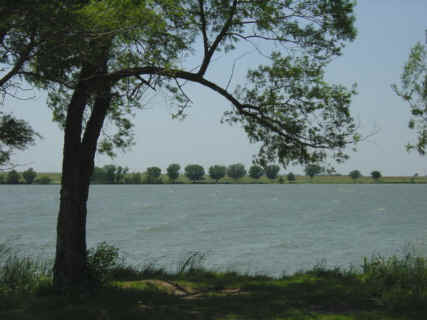 Ownership: The City of Coldwater is responsible for management of the lake. Contact them at (620) 582-2702 if you have specific questions about use or management of the site.